If the bid does go ahead Aldous is likely to join a long list of casualties that will be caused by the free school opening by losing his Waveney seat at the next General Election. 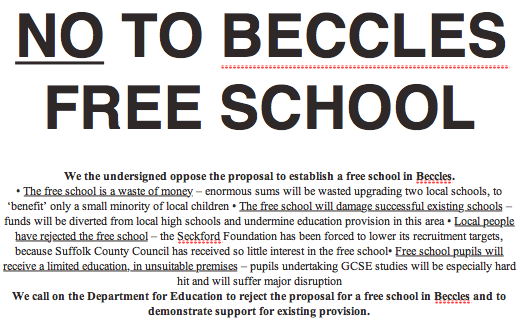 The articles then goes on to list everyone else, all of whom think the proposal in Beccles should be stopped. Jeremy Rowe, Head of the 400 year old Sir John Leman High School and five fellow local Headteachers, the local Conservative County Councillor and Suffolk County Council Leader Mark Bee, and large numbers of local parents. They list of opponents seems to stop only when the article runs out of space. But Graham Watson Bursar of the £13,500 a year Woodbridge School and Director of the Seckford Foundation stands alone against the this and by doing so appears to be arrogantly insisting that he knows better than local people, their MP, their County Councillor, local head teachers and thousands of local people. 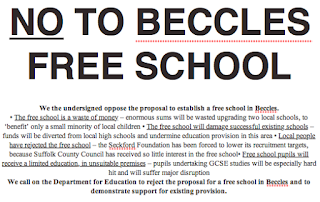 This is the same man who told me at the consultation in Stanton that he did not know much about local schools in Suffolk and admitted that the “demand” at Beccles amounted to expressions of interest of 107 across three school years. I hold out hope because I think they have clearly lost the argument on every single measure.